Resveratrol and Nampt - What is Resveratrol's true target? This is going to be a lot of random blathering and a ton of text by me, so please bear with it if you are really interested. I just needed to get all my thoughts and data out and recorded somewhere. Others thoughts are always appreciated. For some time I've been trying to ascertain how resveratrol activates Sirt1. Using the Fluor de Lys fluorescent system, it was thought resveratrol directly interacted with Sirt1, but this was later proved false, and an artifact of the fluorescent tag. So, if resveratrol does not directly interact with Sirt1, how is it activating it? If anyone here has followed my discussions on niacinamide with 100YearsToGo, which can be found here, you would see how we've discovered, from this paper especially, that the usual levels of niacinamide in the cells are always high enough to inhibit Sirt1. There has been some talk on these forums about avoiding niacinamide supplementation due to its Sirt1 inhibitory effects, but this is not necessary since Sirt1 is always inhibited, except for its vital DNA repair role. Inhibition of Sirt1 is only ended when the ratio of NAD+ to niacinamide increases above the basal levels cells are set at. This happens in response to stressors, such as calorie restriction. CR and other certain types of stress turn on Nampt (also known as PBEF). Nampt is the enzyme that converts niacinamide back into NAD+, which turns on Sirt1 once there is more NAD+ to bind in comparison to niacinamide to inhibit. Could it be then, that resveratrol's real target isn't Sirt1, but Nampt, and that activation of Nampt is what turns on Sirt1? That is, that Nampt is the start of the whole cascade? This paper, "Extension of Human Cell Lifespan by Nicotinamide Phosphoribosyltransferase" clearly points to this possibility. Nampt levels fall with aging, and inhibition of Nampt leads to early aging and senescence. Conversely, overexpression of Nampt increased Sirt1 activity by over 80%, Sirt1 protein abundance, oxidation resistance, and increased life span of vascular cells considerably. Using a dominate negative mutant of Sirt1 co-expressed in Nampt expressing cells resulted in the same phenotype as Nampt inhibition. So then, Nampt's effects are carried out by Sirt1. But, what about resveratrol? This is all interesting because of this paper still in print that I just ran into, which I will not go into gory detail over. "Expression of the longevity proteins by both red and white wines and their cardioprotective components, resveratrol, tyrosol, and hydroxytyrosol" by Subhendu Mukherjee et al. All data belongs to them, and is credited to their labs alone, and I'll remove this data if they don't want it up elsewhere from their paper. I do not want to infringe on any copyrights or intellectual property. Actually getting the paper, we see some startling results, which I will post here for everyone (as I know many cannot get it). This is with rats fed 2.5mg/kg of resveratrol, and looking at their hearts after 14 days on indicated diets. "Fig. 1. Western blot analysis of PBEF in heart tissue obtained from control (I/R) and EtOH-, white wine-, tyrosol-, hydroxytyrosol-, red wine-, and resveratrol-treated heart. GAPDH was used as a loading control. Figures are representative images of three different groups. Results are expressed as mean ± SEM of 3 groups of heart/group. low asteriskp < 0.05 vs Ethanol I/R." Nampt (PBEF) is greatly increased in protein levels by resveratrol verses controls (I/R), by nearly a factor of 3. These aren't mRNA levels, which do not always mean protein is being transcribed, but actual protein. Interestingly, resveratrol's little brothers tyrosol and hydroxytyrosol can also activate Nampt, but not nearly as much (I call them such since they are structurally one half of resveratrol's structure). So we see immediately that resveratrol is causing overexpression of Nampt. Yes, it seems that Nampt may be its real target. "Fig. 2. Western blot analysis of SirT1 protein in heart tissue obtained from control (I/R) and EtOH-, white wine-, tyrosol-, hydroxytyrosol-, red wine-, resveratrol-treated hearts. Histone was used as a loading control. Figures are representative images of three different groups, and each experiment was repeated at least thrice. Results are expressed as mean ± SEM of 3 groups of heart/group. low asteriskp < 0.05 vs Ethanol I/R." Resveratrol doesn't just activate Sirt1, it increases its protein expression in the heart, quite dramatically. Very interesting, as this falls in line with Nampt overexpression, which also upregulates Sirt1 expression. Also notice how the increase over controls is a little less than a factor of 2, again in line with what's been seen before that Nampt overexpression increases Sirt1 by about this much - though resveratrol could always be directly affecting these levels too. Hydroxytyrosol does it even better, however, as we'll see, since it does not increase Nampt (PBEF) nearly as much, hydroxytyrosol is not as potent or as protective as resveratrol. Still, it does imply that resveratrol may also directly activate Sirt1 translation, above just Nampt expression effects. This feeds directly in to the model of function I have come to conclude. "Fig. 3. 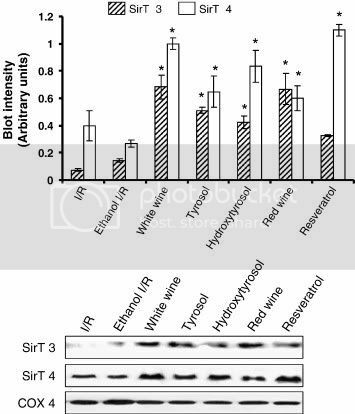 Western blot analysis of SirT3 and SirT4 protein in heart tissue obtained from control (I/R) and EtOH-, white wine-, tyrosol-, hydroxytyrosol-, red wine-, resveratrol-treated hearts. COX 4 was used as a loading control. Figures are representative images of three different groups, and each experiment was repeated at least thrice. Results are expressed as mean ± SEM of 3 groups of heart/group. low asteriskp < 0.05 vs Ethanol I/R." Ah yes, the other sirtuins, of which we have 7. These two are the mitochondrial sirtuins, unlike Sirt1 which is our nuclear version. What they do exactly is still being researched, but Sirt3 controls ATP production (loss of it decreases ATP made in mitochondria), and Sirt4 regulates insulin secretion (Sirt4 dysfunction may be part of the hyper insulin secretion in diabetes type 2). What Sirt4 does in the heart, however, is a big question. However, considering Sirt4 interacts with adenine nucleotide transporter (ANT), it's likely Sirt4 is important for the functions of ANT, which takes ATP out of the mitochondria to the rest of the cell, and brings in ADP to be converted to ATP, as Sirt3 is for Complex I. A critical transporter indeed. Futhermore, Sirt3 and 4 are required to stop the translocation of the apoptotic promoting factor from the mitochondria to the nucleus, and thus are vital proteins in activating the stress response and survival in conditions like CR. Again we see CR also activates Nampt expression, so everything ties together nicely. "Fig. 4. Western blot analysis of phospho-FoxO1, FoxO1, phospho-FoxO3a, and FoxO3a protein in heart tissue obtained from control (I/R) and EtOH-, white wine-, tyrosol-, hydroxytyrosol-, red wine-, resveratrol-treated hearts. Histone was used as a loading control. Figures are representative images of three different groups, and each experiment was repeated at least thrice. Results are expressed as mean ± SEM of 3 groups of heart/group. low asteriskp < 0.05 vs Ethanol I/R." CR and Sirt1 activations leads to phosphorylation of FoxO1 and 3. These proteins, when dephosphorylated, tip the cell towards apoptosis the moment growth factors are removed from the media, but when phosphorylated, cause cell arrest and survival instead. Both functions are anti-cancer. At any rate, resveratrol greatly increases the phorsphorylated form of the FoxOs, protecting cells and activating survival. 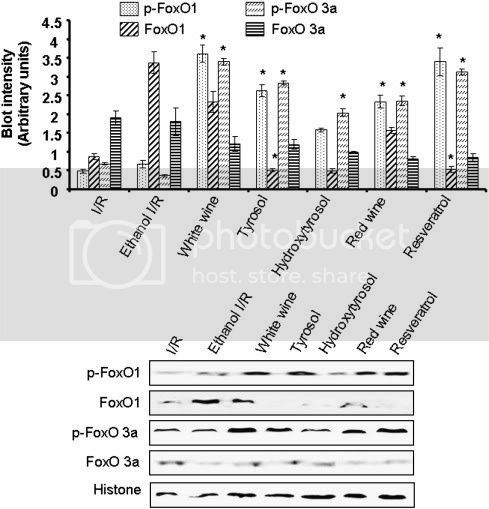 Phosphorylated FoxOs are important for longevity. This is in agreement with data on Nampt, which leads to AMPK activation through Sirt1, which then phosphorylates FoxOs. Resveratrol significantly decreases damage to the heart when infarcted (lack of blood flow, aka heart attack or heart disease). It is so interesting to see such dramatic changes caused by resveratrol in the protein levels of Nampt and Sirt1. Increasing Nampt is where the model of resveratrol action comes in (see here). Since resveratrol increases Nampt, this allows conversion of niacinamide into NAD+. The increasing ratio of NAD+ to niacinamide leads to activation of Sirt1, which turns on PGC-1alpha, the master mitochondrial biogenesis regulator, AMPK and subsequent phosphorylation of FoxOs, and more. We turn back to that question I posed under the thread title. Will niacinamide supplements stop resveratrol from turning on Sirt1? The answer, from this data, is possibly no. Not only maybe no, but they might actually increase the health benefits of resveratrol by giving Nampt more niacinamide to convert into NAD+, pushing the cell more towards NAD+ over NADH as well. Nampt is the rate limiting step in the conversion of niacinamide to NAD+, so the ratio is directly controlled by the speed Nampt starts the NAD+ synthesis pathway verses NAD+ being utilized back into niacinamide (by Sirt1 for instance). Having more Nampt, or more active Nampt, will tip the scales towards NAD+ if all other NAD+ utilizing factors stay the same (the increase in Sirt1 means it'll be self limiting and only work in proportion to Nampt), as we've seen with Nampt overexpression, which resveratrol simulates. So then, as long as there is enough Nampt, and it stays on long enough to tip the balance towards NAD+ and away from niacinamide, Sirt1 will become active. However, if there is a great excess of niacinamide as through supplementation, resveratrol activated Nampt may not be on long enough due to resveratrol clearance and Nampt proteolysis, and the NAD+/niacinamide ratio may never rise high enough to activate Sirt1. We see this with in vitro muscle cells, here, where when resveratrol is added to cells after niacinamide, AMPK and glucose uptake are not activated, which is what they were measuring for Sirt1 activity (and consequently adequate Nampt activity). What happened to Nampt, or PGC-1alpha? Unfortunately they did not test these proteins, so we are left with a incomplete picture. Could it be addition of niacinamide before resveratrol was the reason resveratrol's effects were stopped? 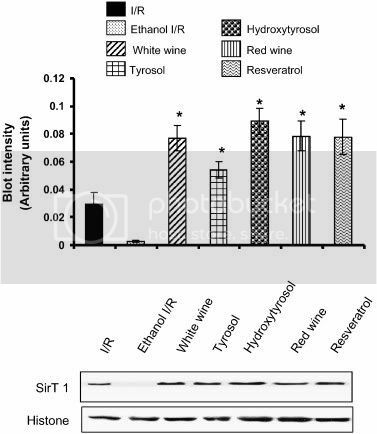 Niacinamide without resveratrol has been shown to downregulate Sirt1 expression (here), and increase adipocity (fat). Apparently, niacinamide doesn't actually turn on Nampt, despite it being Nampt's substrate. However, there may be some tipping point where an overabundance of niacinamide does activate Nampt through other cellular watch dogs. However, what are those controllers of Nampt expression? That is, how did resveratrol increase Nampt expression? Is there an even more upstream target that resveratrol is really working on, or does Nampt feed back on itself for activation? Actually, it seems that Nampt might actually feed back on itself. For instance, Nampt activity activates AMPK, and this activation of AMPK is inhibited by niacinamide (see here again). Yet, on the other hand, AMPK activity is required to activate the transcription of Nampt in response to glucose restriction. Here we have a chicken or the egg problem. Does AMPK activate Nampt which activates AMPK, or does Nampt activate Sirt1 which activates AMPK, which then activates more Nampt production? The latter is what fits the evidence best in my opinion. However, it's still possible resveratrol is actually turning on AMPK. So then, if resveratrol acted directly to activate Nampt, that activity would snow ball into an increase in Nampt and efficient processing of niacinamide into NAD+. On the other hand, a high enough amount of niacinamide will inhibit AMPK and break this process. If resveratrol turned on AMPK which then turned on Nampt, niacinamide wouldn't be expected to break the process and stop AMPK activation, as resveratrol already would have done it. Let's look at this another way and ask what other ways are Nampt turned on? Apparently, as stated before, Nampt transcription is activated by stress and CR, via such factors as IL-1beta (see here) and other proinflammatories. Since resveratrol is an anti-inflammatory molecule, it's not very likely that resveratrol is acting on higher inflammatory responsive pathways to turn on Nampt. Moreover, resveratrol activated Sirt1 actually protects from NF-kB activation, while IL-1beta causes damage, so it's unlikely NF-kB, which is the main responder to proinflammatory signals, turns on Nampt, and neither does IL-1beta in the same way. Even if IL-1beta upregulates Nampt mRNA, other pathways turned on by IL-1beta may outweigh it, or perhaps IL-1beta leads to Nampt secretion into the media instead of increase intracellularly. Now we've moved into the realm of pure speculation and need to stop here, as I don't have the papers to address these questions. More research must be done, but it seems that for now, until higher targets in the pathway are found, I feel, and this is only my opinion, we can say resveratrol's real target is possibly Nampt, and only Sirt1 by consequence. And niacinamide supplementation? Most likely this is favorable and only needs to be spaced a few hours after taking resveratrol, so that resv has the chance to upregulate Nampt protein levels. I would say three hours apart would be optimal, as resveratrol will be mostly cleared by then, and expression of Nampt should be in full swing, or already declining, and Sirt1 should have done its stuff. This could allow synergism between resveratrol and niacinamide, as there'll be plenty of Nampt around after resveratrol stimulation to take that niacinamide and convert it. We'd have to have kinetic studies looking specifically at these factors to know for sure. That is, if resveratrol directly activates Nampt which turns on AMPK through Sirt1, which then turns on more Nampt, then adding niacinamide after this initial step is complete, while capable of inhibiting Sirt1 at first, should still end with the net induction of Sirt1 once Nampt clears the ratio back in favor of NAD+ - until basal levels are reached again. However, too much niacinamide would likely last longer than the enhanced Nampt activity, and indeed inhibit Sirt1 despite resveratrol enhancement - hence why a time spacer is needed between resveratrol intake and niacinamide intake. As niacinamide may stop expression of Nampt after some concentration, especially relative to resveratrol, similar to how over abundance of glucose drives NAD+ levels towards NADH and insulin response inhibition, which seems strange when insulin is trying to turn on clearance pathways for glucose - indeed a possible analogy to niacinamide and Nampt. Obviously, under normal conditions, Sirt1 itself will build up niacinamide, and Nampt will slowly dwindle to some low constant level, leaving us with the condition our well fed selves are at, where Sirt1 is consitutively inhibited and Nampt is functioning at reduced levels only enough to keep cells alive, but not start the stress response longevity pathways. Now, one could say since Sirt1 activates AMPK, which activates Nampt, that resveratrol is still truly acting directly through Sirt1. The only problem here is that niacinamide is still around at inhibitory levels, and it takes Nampt to change that. It's still possible, if resveratrol directly counters niacinamide inhibition at the protein level, of course, but no direct action of resveratrol on the Sirt1 protein has ever been seen, minus that fluorescent tag. So, while possible, it seems less likely than resveratrol working via Nampt activation first, at this time. Resveratrol activates Nampt above basal levels -> Nampt converts more niacinamide to NAD+, pushing the balance towards NAD+ and allowing Sirt1, 3, and 4 if not more to become activated -> Activated Sirt1 leads to activation of AMPK irregardless of the real AMP/ATP ratio levels -> AMPK regulates the production of more Nampt and Sirt1. End result: Resveratrol boosts Nampt protein levels, Sirt1 protein levels and activity, AMPK activity, and leads to the resulting survival, metabolism enhancement, mitochondrial biogenesis, bone density increase, aging reversal phenotypes seen in vivo from resveratrol administration. Pathway ends when: Sirt1 and other NAD+ dependent activities pass a critical point and niacinamide is produced faster than NAD+, or more niacinamide is ingested into the system and overwhelms Nampt activity -> Sirt1 becomes inhibited again -> AMPK becomes dephosphorylated -> Nampt is degraded -> NAD+/niacinamide ratios return to basal levels. Additionally, factors that activate AMPK dephosphorylation could break this cycle too, irregardless of niacinamide. Edited by geddarkstorm, 27 January 2009 - 06:35 AM. thank you for your very complete thoughts on this. I understand the latter part maybe some based on some assumptions, but I will forward this to Dr. V as he is doing some research and maybe this will spark some additional avenues of interest for him. This is an amazing post. Awesome job geddarkstorm. The niacin blocks the SIRT activation. RES and niacin should be avoided together. Or somehow replace the cellular niacin with other anaolgs of niacin in order to help the SIRT activation? In order to increase longevity. Amen. This does seem to tie a number of things together. A higher NAD+/NADH ratio has been proposed as the mechanism behind CR, and at least one thing has been specifically marketed to increase it, Benegene. The topic is in the supplements section. I searched for other things to improve the ratio, and found a paper asserting that alcohol worsened the ratio, but that this could be reversed b a combination of caffeine and serine. Effects of caffeine and serine supplement on alcohol metabolism in Japanese men with different genotype of aldehyde dehydrogenase-2. This paper implies that a simultaneous dose of 30mg/kg of L-serine and 3 mg/kg of caffeine will not only allow Japanese (and other) met to drink like fish, but will also be life extending by improving the NAD+/NADH ratio! This is maybe a little bit of a reach, but if I follow geddarkstorm's post, plus the Japanese paper, I can see taking resveratrol after supper, some niacinamide before bed some three hours later, then on rising a 200 mg tablet of caffeine (instead of coffee) and 2 grams of L-serine to boost the NAD+/NADH ratio. On a night out, take 200 mg caffeine and 2 grams serine, and you'' be able to drink like a Scotsman, and live longer too. It is well known that alcohol intake increases hepatic NADH/NAD ratio, which inhibits further alcohol oxidation and may be ameliorated by the promotion of gluconeogenic pathway. Previously, we found that an oral administration of caffeine (Caf) upregultates several genes involved in gluconeogenesis from serine (Ser) in rats. Furthermore, the fact that a combinational ingestion of Caf and Ser lowered the blood ethanol level suggested their promoting effects on alcohol metabolism. Therefore, we further investigated the effect of an ingestion of Caf and Ser on alcohol metabolism in human volunteers. Subjects were Japanese male with ALDH2*1/*1 and ALDH2*1/*2 genotypes. They took 3 mg/kg Caf and 30 mg/kg Ser 30 min prior to ingestion of 0.4g /kg alcohol. Blood samples were collected from each subject at 30 min intervals until 3 hrs after alcohol intake. Similarly, control experiment was carried out on a different day. In control experiment, there was no substantial difference in the levels of pyruvate, lactate and their ratio (L/P) reflecting NADH/NAD among ALDH2 genotypic groups. However, we separately compared blood parameters in each ALDH2 genotypic group because levels of ethanol, acetaldehyde and acetate were significantly affected by the genotype. In ALDH2*1/*1 subjects, blood acetaldehyde was significantly lowered by Caf and Ser while such a difference was not observed in ALDH2*1/*2. In all genotypic groups, L/P ratio was markedly increased and this elevation was lasted until 3 hours after alcohol intake. The supplement of Caf and Ser significantly repressed this increase of L/P ratio and promoted recovery to pre-ingestion levels with a significant elevation of pyruvate level. In contrast, supplement of Caf or Ser alone did not alter these blood metabolic parameters. These results indicated the possibility that the combinational supplement of Caf and Ser cooperatively improved redox state of liver and accelerate the alcohol oxidation in alcohol drinking. Do you have an estimate, how much niacinamide would be optimal with res? Edited by Kutta, 28 January 2009 - 07:56 PM. Niacin does not inhibit Sirt1 to my knowledge, only niacinamide has been shown to by specifically binding and sequestering a product intermediate during the deacylation reaction catalyzed by Sirt1. Ironically, niacin, aka nicotinic acid, is processed into NAD+ though a completely different pathway in the body than niacinamide, aka nicotinamide, is. Some niacin does get turned into niacinamide during absorption in the gut, but it's a small proportion. Since all food borne NAD(P)(H), NMN, and NR are turned into niacinamide before absorption by the gut, and since niacinamide is the major circulating form of vitamin B3 in the body until conjugated in the liver and passed out by the kidneys, the niacin pathways actually appear to be more of a backup or legacy system in humans. In all practicality, niacin is a good way to boost NAD+ without first increasing niacinamide levels, and so can be predicted to activate Sirt1 transiently, until enough NAD+ is used up into niacinamide. Niacin is just a little harder on the body so to speak, as it seems to have unique side effects due to its conversion pathway that no other form of vitamin B3 processes (such as causing a "flush"). This makes it harder to take at the levels niacinamide and derivatives can be, though niacinamide can also be toxic to the liver at high doses (over 3 grams per day). Therein, activating pathways that convert niacinamide into NAD+ is more practical and effective than only taking niacin, but both at once should be quite potent. Very interesting. This information fits amazingly well with the results of that paper in my first post, where ethanol by itself basically abolishes Sirt1 from the hearts of rats, and causes a whole bunch of other bad effects. But obviously, the components in wine, like resveratrol, can counteract and supersede it, making moderate wine drinking surprisingly beneficial. Now it seems caffeine and serine can also counter ethanol, and even maybe activate Nampt since the NAD+ ratio went up, so putting it all together like you listed could make one really potent force. Cool ideas! The niacinamide, and other derivatives that get turned into niacinamide, in our food is not enough to stop resveratrol action, since mice studies used resveratrol in food predominantly for their in vivo administrations. Yet, we've seen that 100 uM of niacinamide administered before resveratrol will block the latter's Sirt1 activation completely. Exactly what the ratio of niacinamide to resveratrol is that will stop resveratrol activated Nampt from being able to boost the NAD+/niacinamide ratio high enough to get Sirt1 going, I have no idea without research looking directly at this. This is why I recommend taking niacinamide three hours after resveratrol. By this time, as far as it seems to me, resveratrol should be pretty much gone and Sirt1 activated niacinamide-insensitive longevity cascades should be in full swing, but there will probably be enough Nampt left over and kicking to really utilize any extra niacinamide boost to good effect. That way, you get all the goodness of resveratrol and niacinamide without the two competing with each other; and possibly even synergize them (resveratrol pre-treatment may seriously boost niacinamide effectiveness based on these hypotheses). Still, we can't know for sure the best timings without actually kinetic studies in vivo monitoring all these factors and activities. So, I'm playing it safe based on how fast resveratrol comes and goes (half life of 14-30 minutes or so, thus 3 hours should flush it out mostly). Edited by geddarkstorm, 30 January 2009 - 01:22 AM. I like this theory of yours. As a consequence activation of Nampt causes more NAD production. This is not only good for sirt1 but a host of other things. Among them glycosis and the kreb cycle because NAD(H) is an essential component in the reactions that take place there. Maybe that explains the better energy of mice and as anectdotally reported, of men too when taking resveratrol. Good stuff. Now we need someone with a lab to proof it. BTW is Nampt boosted by CR? have to take a look at that. This is why I recommend taking niacinamide three hours after resveratrol. I think there are some analogs of Niacin that may be synergistic or enhance RES SIRT activity? I'd love to see research directed at dissecting this issue, it would be very useful at so many levels to know one way or the other. And you betchya, Nampt levels and activity has been shown to be increased with fasting and calorie restriction. Note that PNC1 is the yeast name for Nampt. Hm, interesting. Have to see when these come to the market and what their full characterizations reveal. 1. I think Resveratrol's true target is a precursor to AMPK. 2. I think the pathway is probably as follows: Resveratrol/Exercise/CR (aka POSITIVE stress) --> LKB1 --> AMPK (response to stress) --> NAMPT --> Increased NAD+. 1. It makes the most sense to me. 2. http://cimonline.ca/...iewArticle/4796 <-- these guys actually looked into it. 3. http://www.imminst.o...showtopic=15578 <-- this article seems somewhat consistent w/ the statements in #2. Obviously this isn't a very analytical post here and the two studies don't EXACTLY deal with nampt in the overall cascade process. But based on my reading, AMPK just seems to naturally respond to an imbalance in the intracellular environment between energy requirements and energy available. Therefore, I think it is upstream from NAMPT creation and a step later in the cascade process. Very interesting information, thanks for posting this. I read that white wine / red wine study too and was surprised to see that white wine scored better in some areas than red wine even though it has less (none I think?) resveratrol. Maybe white wine deserves another look. 1. Is taking niacinamide without resveratrol a good idea? 2. If fasting increases Nampt levels, what would be a good time to take niacinamide when fasting? Before, during or after? White wine does indeed have resveratrol, though lower levels of it. It also has other resveratrol analogues that can mimic to an extent some of resveratrol's properties, but are not nearly as consistent across the board. The niacinamide form of vitamin B3 is just fine to take and has a bit of unique good properties itself. During a fast, you'd probably want to take it near the end, I would speculate. If you take more than Nampt can handle, niacinamide will shut down Sirt1, but without dedicated research it's impossible right now to really say how much niacinamide would be too much. I also was surprised about the white wine resveratrol content. 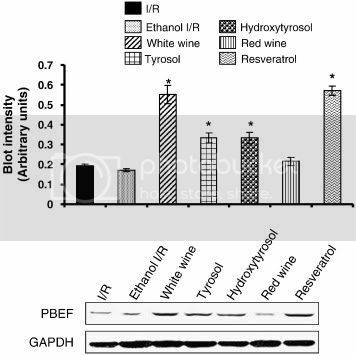 As a follow-up to that issue, I wonder about the quercetin content in white wine vs. red wine and how that plays out in studies comparing the bioavailability of resveratrol from the two different wines. I would have imagined that red wine has more quercetin and if it really is a co-factor which enhances overall resveratrol uptake and is not competitive, then it should manifest itself between the two different wine types. 1. B3 before workout (fasting period). - Nampt gets increased from cardiovascular exercise and can take advantage of the excess niacinamide. - B3/NAD+ tends to amplify GH levels in the body, assuming it is not consumed with food/fats. 2. Resveratrol just before eating. - Bioavailability is a problem with resveratrol and if we are trying to mimic CR/blunt the insulin response to food it seems the best time to take it is at the beginning of a meal. What do you think, geddarkstorm? Edited by prophets, 13 March 2009 - 06:15 PM. Fascinating - could the impact of resveratrol on NADH/NAD+ be a factor in the increased physical endurance that many people report? Here's a paper that compares niacin -> NAD and niacinamide -> NAD. The former is insensitive to NAD concentration, but the latter is feedback controlled, as Geddarkstorm has already pointed out. Inositol hexanicotinate doesn't cause a niacin flush, so that's what I take. J Biol Chem. 2007 Aug 24;282(34):24574-82. Elevation of cellular NAD levels by nicotinic acid and involvement of nicotinic acid phosphoribosyltransferase in human cells. Hara N, Yamada K, Shibata T, Osago H, Hashimoto T, Tsuchiya M.
NAD plays critical roles in various biological processes through the function of SIRT1. Although classical studies in mammals showed that nicotinic acid (NA) is a better precursor than nicotinamide (Nam) in elevating tissue NAD levels, molecular details of NAD synthesis from NA remain largely unknown. We here identified NA phosphoribosyltransferase (NAPRT) in humans and provided direct evidence of tight link between NAPRT and the increase in cellular NAD levels. The enzyme was abundantly expressed in the small intestine, liver, and kidney in mice and mediated [(14)C]NAD synthesis from [(14)C]NA in human cells. In cells expressing endogenous NAPRT, the addition of NA but not Nam almost doubled cellular NAD contents and decreased cytotoxicity by H(2)O(2). Both effects were reversed by knockdown of NAPRT expression. These results indicate that NAPRT is essential for NA to increase cellular NAD levels and, thus, to prevent oxidative stress of the cells. Kinetic analyses revealed that NAPRT, but not Nam phosphoribosyltransferase (NamPRT, also known as pre-B-cell colony-enhancing factor or visfatin), is insensitive to the physiological concentration of NAD. Together, we conclude that NA elevates cellular NAD levels through NAPRT function and, thus, protects the cells against stress, partly due to lack of feedback inhibition of NAPRT but not NamPRT by NAD. The ability of NA to increase cellular NAD contents may account for some of the clinically observed effects of the vitamin and further implies a novel application of the vitamin to treat diseases such as those associated with the depletion of cellular NAD pools. Sounds good to me. Food doesn't affect the AUC of resveratrol much, at least, so taking it with food or right before likely won't make a difference (unless quercetin or other absorption enhancing factors are in the food). Taking niacinamide a little while before hand as you listed may also give levels of Nampt time to stabilize and prime for activation with resveratrol, giving you the most bang for your buck. This is of course complete speculation on my part really, as we'd have to get some good studies looking at the two in such a way to really say what was best. Still, it's a great idea, I think. On the other hand, as Krillin just posted and pointed out, niacin is considerably better to take than niacinamide, I think, especially for our purposes. Putting the two together, resveratrol and niacin, could potentially be very potent: relieving niacinamide inhibition of Sirt1 with resveratrol while at the same time greatly boosting NAD levels with niacin. You can sort of treat niacinamide as a "toxid waste byproduct" (it isn't toxic, just in the sense of Sirt1 activity) left over by NAD+ utilizing enzymes, and Nampt is capable of disposing of, and reprocessing the waste, while niacin brings in fresh resources, allowing Sirt1 to function at its peak for a lot longer. I believe that is likely. @Krillin: Great paper, thank you for posting it and bringing it to our attention. 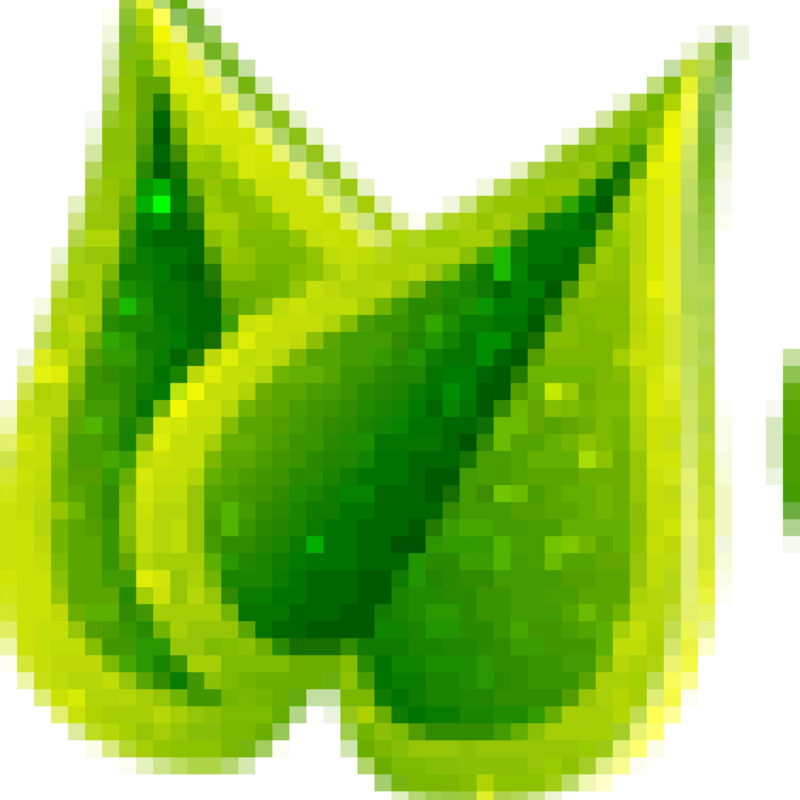 Edited by geddarkstorm, 16 March 2009 - 10:12 PM. Are you considering the fact that not all tissues express NAPRT? You'll be elevating NAD in those tissues that do with supplemental niacin, but then niacinamide levels will rise system wide as a "waste product" of the NAD you just created. This extra niacinamide will now be floating around in tissues that had no NAPRT and did not enjoy a boost of NAD or SIRT1 activation, where it may now act to inhibit SIRT1. And now for something unexpected. AMPK activation by metformin upregulates beta-secretase which leads to beta-amyloid. But the combination of insulin and metformin reduces beta-amyloid levels. Is a healthy physiological level of insulin sufficient? Proc Natl Acad Sci U S A. 2009 Mar 10;106(10):3907-12. Antidiabetic drug metformin (GlucophageR) increases biogenesis of Alzheimer's amyloid peptides via up-regulating BACE1 transcription. Chen Y, Zhou K, Wang R, Liu Y, Kwak YD, Ma T, Thompson RC, Zhao Y, Smith L, Gasparini L, Luo Z, Xu H, Liao FF. Neurodegenerative Disease Research Program, Burnham Institute for Medical Research, La Jolla, CA 92037, USA. Epidemiological, clinical and experimental evidence suggests a link between type 2 diabetes and Alzheimer's disease (AD). Insulin modulates metabolism of beta-amyloid precursor protein (APP) in neurons, decreasing the intracellular accumulation of beta-amyloid (Abeta) peptides, which are pivotal in AD pathogenesis. The present study investigates whether the widely prescribed insulin-sensitizing drug, metformin (Glucophage®), affects APP metabolism and Abeta generation in various cell models. We demonstrate that metformin, at doses that lead to activation of the AMP-activated protein kinase (AMPK), significantly increases the generation of both intracellular and extracellular Abeta species. Furthermore, the effect of metformin on Abeta generation is mediated by transcriptional up-regulation of beta-secretase (BACE1), which results in an elevated protein level and increased enzymatic activity. Unlike insulin, metformin exerts no effect on Abeta degradation. In addition, we found that glucose deprivation and various tyrphostins, known inhibitors of insulin-like growth factors/insulin receptor tyrosine kinases, do not modulate the effect of metformin on Abeta. Finally, inhibition of AMP-activated protein kinase (AMPK) by the pharmacological inhibitor Compound C largely suppresses metformin's effect on Abeta generation and BACE1 transcription, suggesting an AMPK-dependent mechanism. Although insulin and metformin display opposing effects on Abeta generation, in combined use, metformin enhances insulin's effect in reducing Abeta levels. Our findings suggest a potentially harmful consequence of this widely prescribed antidiabetic drug when used as a monotherapy in elderly diabetic patients. This is a problem no matter what, unfortunately. Sirt1 will generate niacinamide, as will the other NAD+ enzymes that utilize it in a similar manner (i.e. non-redox reactions). It seems completely true from what research has been posted elsewhere (especially the niacinamide thread), that NAD+ and niacinamide are in an equilibrium, and that the basal levels of niacinamide are always high enough to inhibit Sirt1 in vivo, unless you have a horrible B3 deficiency. This is why niacin by itself isn't going to turn on Sirt1 to any appreciable extent. Resveratrol is still absolutely needed to de-repress Sirt1's inhibition from niacinamide before anything can happen, but niacin with resveratrol does give a momentary "free" boost in NAD in those NAPRT expressing tissues, without having to deal with niacinamide first. It's an interesting problem though, as I believe you are right, and if one takes too much niacin with resveratrol, you'll end up hurting non-NAPRT expressing tissues. Ratios would be crucial... Still, it's better than taking niacinamide with resveratrol, as then there's an even higher curve of niacinamide Nampt has to clean up before Sirt1 can even become active, and without Sirt1 active fast enough, the feedback loop to continue Nampt stimulation will not likely occur, so things will just fizzle out rapidly. This is seen in some studies in vitro where large mM doses of niacinamide are used to inhibit resveratrol activated Sirt1, so it can trump resveratrol at high enough doses, which makes sense as resveratrol isn't going to be around for too long, and the pathway has to get turned off somehow. The Nampt -> Sirt1 -> AMPK -> Nampt feedback loop cannot continue for too long in the face of Sirt1 niacinamide production and without continued exogenous activation of Nampt; as it's generally off (or at very low levels) in vivo or resveratrol wouldn't do anything, heh. Edited by geddarkstorm, 16 March 2009 - 11:35 PM. We here showed that NA increases cellular NAD levels from the basal of around 0.5 mM to near 1 mM. Because the Km value for NAD in the SIRT1 reaction has been reported to be about 0.5 mM (44) and, importantly, unlike Nam, NA does not inhibit SIRT1 (45), such increases in cellular NAD levels by NA would significantly stimulate the deacetylase activity of SIRT1 in the cells and modulate a variety of cell functions. Further investigation will be required to test whether the administration of NA indeed stimulates SIRT1 activity in the cells. PMID: 17725178 got a Cmax of 75 microM from 2000 mg of time release niacin. So somewhere above 100 mg of niacin could bring the maximal NAD increase. And here I was taking 100mg of nicotinic acid 4x daily before this came out. I'm such a visionary. Hm, that's a great find Krillin and quite interesting. There seems to be a huge disparity in their numbers, since there's no way a 5 micromols of NA can become 500 micromols of NAD+, unless the NA also activated other NAD+ production pathways (i.e. Nampt) in the process. That, in and of itself, is quite something. Unless it is a typo, and they meant 5mM NA, then we'd have a 10% conversion efficiency. Actually, I don't think the question is about raising NAD+ levels so much as about how do we lower niacinamide levels, according to current understanding (as far as I know) such as reviewed in detail here. NAD+ levels ("400 to 700 uM in human cells", in agreement with the paper you quoted) are already around or a bit higher in cells than the Km's for Sirt1 and other NAD using enzymes ("Km's for NAD+ of human and yeast sirtuins are in the range of 100 to 300 uM"). Being at the Km concentration should give half maximal catalytic activity if I remember my enzyme kinetics right. That is, there is basally more than enough NAD+ for these enzymes to be active. At the same time, there's more than enough niacinamide around, basally ("typically in the 50-150 uM range"), to keep these enzymes mostly inhibited ("inhibitory constants for nicotinamide have been determined to be in the range of 30 to 200 uM for a variety of different sirtuin enzymes"), which is what we see in vivo/vitro (hence why products like resveratrol can activate them in the first place). So, NAD+ is in abundance, but so is the inhibitor, and the inhibitor wins out since it binds in the catalytic pocket and quite thoroughly blocks catalysis. Therefore, to activate Sirt1 and other NAD+ utilizing enzymes that are inhibited by niacinamide, we need to drop the niacinamide levels, rather than simply boost NAD+. This is one reason why it seems to me that resveratrol most like works via activating Nampt directly, as Nampt will catalyze niacinamide into NAD+, thereby removing the inhibitor and giving these enzymes the chance to use NAD+, and also raising NAD+ even farther above the Km value. Nampt has the ability to break the equilibrium between NAD and niacinamide, transiently, long enough for the pathways to get rolling, and so it's no surprise to me that Nampt has been singled out in yeast to be one of the master longevity switches by which the others are turned on down the pipe. What else can activate Nampt is unknown to me, though I searched heavily to find the answer. Most work in humans has looked exclusively at its role as a hormone/cytokine/adipokine once secreted, but we are interested in its intracellular action. Haha, the da Vinci of our times! Hm! I'll have to look over this more carefully when I get more time. Resveratrol has been shown to help keep some types of circadian systems working right... I'll do my huge post today, or try to, with everything and citations (which are very time consuming to gather, which is why it's taking me so long to do) including that. Edited by geddarkstorm, 24 March 2009 - 04:57 PM. im going to put up another post on astragaloside iv, based on the 3 documents JLL provided later this week. im jammed up on work as well. I'm having trouble figuring out how to explain this paper's resveratrol-potentiated NAD(+) depletion if resveratrol just increases NAD(+) without also activating SIRT1. Eur J Neurosci. 2006 Oct;24(8):2169-76. Zinc neurotoxicity is dependent on intracellular NAD levels and the sirtuin pathway. Cai AL, Zipfel GJ, Sheline CT.
Department of Neurology, Washington University School of Medicine, 660 S. Euclid Ave, St. Louis, MO, USA. Zinc neurotoxicity has been demonstrated in ischemic, seizure, hypoglycemic, and trauma-induced neuronal death where Zn(2+) is thought to be synaptically released and taken up in neighbouring neurons, reaching toxic concentrations. We previously demonstrated that toxicity of extracellular Zn(2+) depended on entry, elevation in intracellular free Zn(2+) ([Zn(2+)](i)), a reduction in NAD(+) and ATP levels, and dysfunction of glycolysis and cellular metabolism. We suggested that PARP-1 activation alone can not explain this loss of neuronal NAD(+). NAD(+) was recently demonstrated to permeate neurons and glia, and we have now shown that exogenous NAD(+) can reduce Zn(2+) neurotoxicity, and 3-acetylpyridine, which generates inactive NAD(+), potentiated Zn(2+) neurotoxicity. Sirtinol and 2-hydroxynaphthaldehyde, inhibitors of the sirtuin pathway (SIRT proteins are NAD(+)-catabolic protein deacetylases), attenuated both acute and chronic Zn(2+) neurotoxicity. Resveratrol and fisetin (sirtuin activators) potentiated NAD(+) loss and Zn(2+) neurotoxicities. Furthermore, neuronal cultures derived from the Wld(s) mouse, which overexpress the NAD(+) synthetic enzyme nicotinamide mononucleotide adenyl transferase (NMNAT-1), had reduced sensitivity to Zn(2+) neurotoxicity. Finally, nicotinamide was demonstrated to attenuate CA1 neuronal death after 10 min of global ischemia in rat even if administered 1 h after the insult. Together with previous data, these results further implicate NAD(+) levels in Zn(2+) neurotoxicity. The implication of course is that resveratrol does activate SIRT1. Many other genes are also activated by resveratrol:TNF, MAPK1, MAPK3, AKT1, TP53, PTGS2, IL1B, CASP3, ESR1... see http://ctd.mdibl.org...amp;acc=C059514 I do not see NAMPT on the list. Don't forget wikipedia has provided the reference for about a year where a researcher proposed RESV → SIRT1 / NAD+ → FOXO3a → MnSOD, so that MnSOD could be the primary benefit of RESV. Since about 1990, Russian researcher Tiina Karu has shown that 670 nm and 830 nm light increases the ratios NAD+/NADH, NADP+/NADPH, GSH/GSSG, and increase Ca+2, alkalinity by 0.2 units. Presumably this all results from increased ATP. (all her research is online http://www.isan.troitsk.ru/dls/publ/ ) These wavelengths penetrate blood and water. At 4 to 6 J/cm^2 kick-starts cells into generating more ATP (the 2 copper atoms in CCO do the light-absorbing in the electron transport chain), increasing healing rate by a factor of 5 in U.S. navy seals. To get benefit from sunlight with or withut sunscreen, you would need about an hour per day and not have much body fat to block the light so that superificial tissues can receive it. 4 to 6 J/cm^2 is for direct cell exposure but skin blocks maybe 90% of the incoming light. Only about 10% of sunlight is in the beneficial ranges (610-625, 660-690, 750-770, and 815-860 nm). These wavelengths correspond to cell ATP generation and matches up with CCO quantum calculations and direct measurement that says one of the copper atoms either reduce or oxidize at these 4 wavelengths. 10 J/cm^2 completely nullifies the beneifits. It applies to all animals cells whose mitochondria use pretty much the same CCO ATP pump that evolved from light-activated purple bacteria when mitochondria and blood first evolved. It appears blood evolved to specifically allow these wavelengths through. The first (very small) animals benefit more since sunlight can only penentrates about 1 cm. My point is that sunlight, exercise, CR, and RESV (et al supplements) are all acting at the core and people are starting to get it figured out. Bump for a good thread. Anything new on the is front? Anyone taking l-serine with caffeine? Anyone taking MB and resveratrol? Edited by health_nutty, 09 June 2010 - 05:38 PM.